When the famous "Hollywood" sign fell into disrepair in 1978, various entertainers agreed to buy a letter for $27,777.77. Gene bought the first "L."
The official Gene Autry biographer, Holly George-Warren, summarizes the history of the song Rudolph, the Red-Nosed Reindeer in her book Public Cowboy No. 1: The Life and Times of Gene Autry. But it was Gene's second session  on June 27, 1949  that yielded the most enduring hit of his entire career. "Here Comes Santa Claus" had begged a follow-up: submissions arrived over the transom from numerous eager songwriters, including one tuneful narrative based on a 1939 poem popularized by Montgomery Ward. The story of an outcast reindeer whose "difference" ultimately helped him save Santa's threatened sleigh ride, "Rudolph, the Red-Nosed Reindeer" was written by veteran composer Johnny Marks. His brother-in-law, copywriter Robert L. May, originally had penned the verse for the department store's annual holiday booklet giveaway, a practice discontinued in 1947. The copyright became May's, who got the poem published as an illustrated children's book that sold one hundred thousand copies. May then permitted Marks to use the story for a composition. "I thought about it for a while and sat down to write a song about it," Marks related. "That song was easily one of the worst songs ever written. Then about a year later I was walking down the street when a new melody came to me. It's the only time that ever happened, and I have to admit, it's a great melody." Marks sent a demonstration recording to RCA Victor recording artist Perry Como, but the pop singer turned it down when the composer wouldn't allow him to change any lyrics. Marks later confessed to Gene it had been rejected by Bing Crosby and Dinah Shore as well. Over the years, Gene always told the story that he didn't care for the song either, but that Ina heard Marks's demo acetate and, "enchanted" by its "Ugly Duckling" theme, encouraged him to record it. It became widely acknowledged that if not for Ina, there would be no "Rudolph" by Gene Autry. According to Carl Cotner's widow, Juanita, Marks originally contacted Gene's musical director and "wanted Carl to talk Gene into [recording it]... Johnny Marks had... said, 'I'll give you a piece of the action if you will do it,' and Carl said, 'Well, I don't want that,'... which was not a good business [decision], but that was Carl. Carl had told Gene, 'I think it's a good song for you,' and Carl did the arrangement. When working out the material for the session, Gene said, 'How about that song that you're so crazy about?' They threw it up on the stand, and did it in one take... [Later] a publicity man put it out that it was Ina that talked Gene into it." 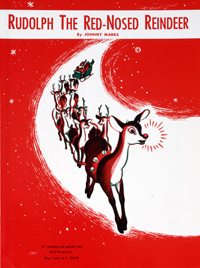 "Rudolph" eventually would be recorded by more than five hundred artists, but Marks always preferred Gene's version: "The great success of the Rudolph record," Marks wrote him the following year, "was your perfect rendition of the song... Two bar intro, ad lib verse, solo chorus in tempo, thirty-two bar instrumental, and the last chorus with the Pinafores." In 1961 he told Gene, "What I sent you in 1949 were ink dots on a piece of paper. You had to translate this into a sound, lyrically and musically, that people would like. How many great songs have been lost because of the wrong rendition? Many people have said: 'Any one could have made a hit with Rudolph.' My answer has always been: 'We'll never know. I only know that Gene Autry did do it, and that all the others followed." Five weeks later, on August 4, Gene cut two more Christmas numbers, "Santa, Santa, Santa" (credited to Haldeman and Autry) and "If It Doesn't Snow on Christmas," the latter of which became the flipside to "Rudolph." As Columbia previously had packaged "Here Come Santa Claus," "Rudolph" was issued in a colorful picture sleeve. "[This] marketing innovation... emerged in the late forties with Gene Autry's 'Here Comes Santa Claus' and 'Rudolph,'" according to music historian Dave Marsh. "This was little more than a sales technique based on the theory that if a youngster or his mother were shopping for records, and the kid spotted a colorful cartoon picture of Santa on the sleeve of 'Here Comes Santa Claus,' junior would pester mom until she put some cash into the pocket of the shrewd record marketer. Picture sleeves soon became a prestige part of any single release." "Rudolph" became a favorite on The Hit Parade and soared to the top of the Billboard country & western and pop charts  a first for Gene. (In 1947 "Here Comes Santa Claus" had been Gene's initial entry on the prestigious Billboard pop chart.) Marks later recalled how Gene helped to promote the song: "I recall my struggle of 1949 and how you went out of your way to help. Among the many, many things you did, I particularly remember asking you to sing the song at Madison Square Garden. You were reluctant and rightly so, but said you would try it out and you did... I asked you to do it on your radio show. You told me the producer and sponsor were adamant against doing a Christmas song so early, but did it anyway." For the rodeo Marks even supplied Gene with a Rudolph costume with flashing red nose, donned by Frankie Marvin, who pranced around the arena. (After the Boston Garden stint, he somehow lost the pants, which Marks replaced for the 1950 rodeos.) During it first year of release, "Rudolph" sold two million copies, selling an estimated twenty-five million more over the next forty years. For decades it remained the best-selling single of all time after Bing Crosby's "White Christmas." "Rudolph" also anticipated a new trend for Gene: recording discs specifically geared to the children's market. This recording of Rudolph, the Red-Nosed Reindeer is a Platinum Record. 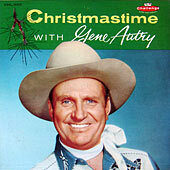 In the Autumn of 1957 in Hollywood, California Gene Autry recorded seven Christmas tracks that were originally released on LP as Christmastime with Gene Autry on his own Challenge record label. He of course included Rudolph, the Red-Nosed Reindeer for this collection. All songs had vocals by Gene Autry with accompaniment by full orchestra and chorus condected by Carl Cotner. The 2018 holiday season was extra special for Gene Autry and his classic Christmas songs because "Rudolph, the Red-Nosed Reindeer" and "Here Comes Santa Claus (Right Down Santa Claus Lane)" charted on the Billboard Hot 100 for the first time! Gene Autry earns his first-ever Billboard Hot 100 entry with "Rudolph, the Red-Nosed Reindeer"
Every November, the American Society of Composers, Authors and Publishers (ASCAP) announces its Top 25 most-performed holiday songs for the past five years. 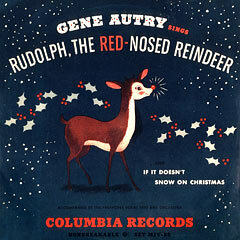 Of course, Gene Autry is on this list and so is the song Rudolph, the Red-Nosed Reindeer! Won't you guide my sleigh tonight? You'll go down in history. © 1949, (Renewed) by St. Nicholas Music Inc.
For the first time ever, Hal Leonard presents a collection of 25 Gene Autry Christmas classics.